Field Marshal Arthur Wellesley, 1st Duke of Wellington, is regarded as one of the great military leaders of the 19th Century. 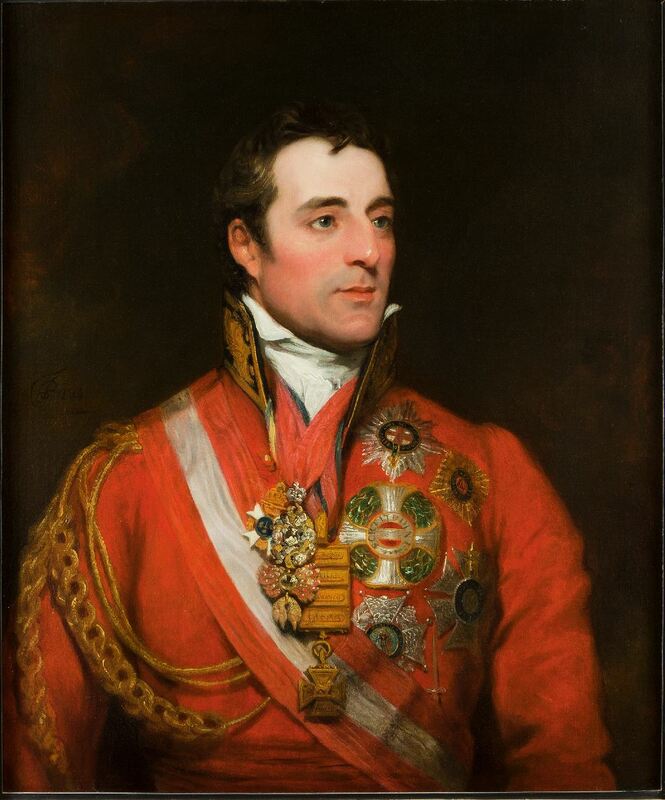 Having served in Belgium and India, he rose to the rank of Major-General and was then appointed Field Marshal in the Peninsular Campaign during the Napoleonic Wars. Sealing his status as Britain’s top military hero, he defeated Napoleon at Waterloo, and was subsequently awarded a dukedom. Henry Angelo by Mather Brown, Oil on Canvas, ca. 1790. Courtesy of The National Portrait Gallery, NPG 5310. 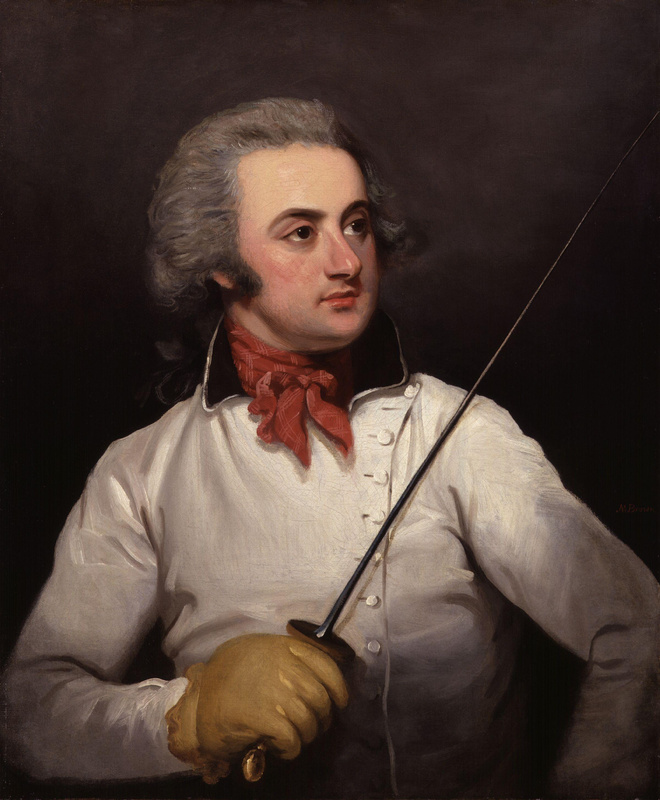 Two years following his momentous victory, he was reflecting on the nature of swordsmanship among British soldiers. At the time, Henry Angelo, son of the famed and inimitable Domenico Angelo, had developed and codified the British military’s use of the Scottish back sword in 1798 in his Hungarian and Highland Broad Sword at the behest of his patron, Colonel Herries. The Colonel had found the lack of sword training and overall fitness of his Light Horse Volunteers of London to be troubling. What Angelo the Younger created was a somewhat derivative and amalgamated approach to broadsword integrating elements of continental sabre, Scottish basket-hilt, and single stick forms. The following year Angelo released The Manual and the Ten Divisions of the Highland Broad Sword — a broadside of his broad sword method illustrated by Thomas Rowlandson. “Angelo’s easy-to-understand Lessons… became the standard sword drill for generations of English recruits for years to come” (Gordon, 2014). Detail from broadside by Henry Angelo & illustrated by Thomas Rowlandson,”The Manual and the Ten Divisions of the Highland Broad Sword” (1799). These historic images were edited by Nick Thomas, Instructor at the Academy of Historical Fencing, UK. I had intended to write you respecting the broadsword exercise taught by Major Angelo of the 21st, when I received a letter from the Adjutant-General, dated the 20th, desiring that I should report whether I consider it for the benefit of the service that Major Angelo should continue with the army in France. I conceive that nothing can be more desirable than to teach officers and soldiers the use of the sword. The want of the knowledge of the use of the sword has, to my certain knowledge, more than once made our officers appear to disadvantage in the broils which are not unfrequent [sic] with the French and other officers on the Continent. They are obliged to defer the settlement of the dispute till a pistol can be got; and the acknowledgement of the ignorance of the use of the weapon which every officer carries, besides being in itself degrading, is generally considered and taken as proof that our officer wishes to avoid the contest by him who is probably himself the most desirous of avoiding it. I therefore think the knowledge of the use of the sword, or the science of fencing, is essentially necessary to every officer who is to wear one; but I confess that it is not that description of knowledge taught by Major Angelo which I mean. The knowledge gives suppleness and address to the body and limbs, and applies to the use of the broadsword; but everybody who knows what a sword is, is aware that a man with a broadsword has no chance with one who has a small sword. The very act of lifting up his arm to use the former, would give the opportunity to him who should know the use of the latter to run him through the body. If, therefore, His Royal Highness would allow me to keep Major Angelo here to teach fencing with the small sword, I should think his presence with the army most desirable. His school, however, for the broadsword, I cannot consider in any other light than as another and very good drill to give ease and address to the body and limbs of the officers and soldiers; and that it is not necessary to detain him longer for that purpose. As evidenced by one of the great military leaders of his century, the advantages of the smallsword, especially in single-combat, are numerous. Owing to its size, geometry, lightness, and speed of attack, only the foolhardy would underestimate its efficacy — a trend that seems to be popular presently. To learn more about Henry Angelo’s lessons on the broadsword and to view restored images of Rowlandson’s illustrations, visit Columbia Classical Fencing here. Angelo, Henry & Son. (1798), Hungarian and Highland Broad Sword. Thomas Rowlandson, Illustrator. Peter Valentine, Transcriptionist, 1999. Retrieved from TheARMA.org. Mirrored by Columbia Classical Fencing here. Angelo, Henry & Rowlandson, Thomas. (1799), The Manual and the Ten Divisions of the Highland Broad Sword: As Practiced by the Dismounted Troops of the Light Horse Volunteers of London and Westminster. London: Henry Angelo, 1799. Angelo, Henry & Rowlandson, Thomas. (2016), The Manual and the Ten Divisions of the Highland Broad Sword &C. Nick Thomas (Ed.) Academy of Historical Fencing, UK. Murray, J. (1865). Supplementary Despatches, Correspondence, and Memoranda of Field Marshal, Arthur Duke of Wellington, K.G., Edited by His Son, The Duke of Wellington, K.G., Vol. 12. London: John Murray. Retrieved from https://books.google.com here. This entry was posted in Art, Historic Text, Quote and tagged 1817, 19th Century, Broad Sword, Broadsword, Duel, Duke of Wellington, Henry Angelo, Portrait, Regency Era, Single-Combat, Small-sword, Smallword. Bookmark the permalink. Glad you are enjoying the large resolution and restored work of Angelo. It was undertaken recently by myself, Nick Thomas (Instructor at the Academy of Historical Fencing, UK), from a friend’s original, but rather worn copy. Thanks for letting us know, Nick. Nice work! As soon as I can, I will update the post to credit you, and link to your salle.